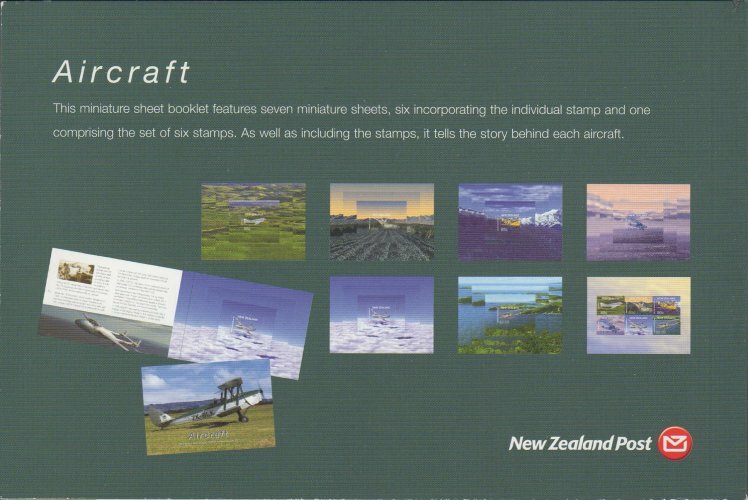 The booklet contains one of each value, in the set of 6 Aircraft, in miniature sheet form and a seventh miniature sheet containing all 6 values. 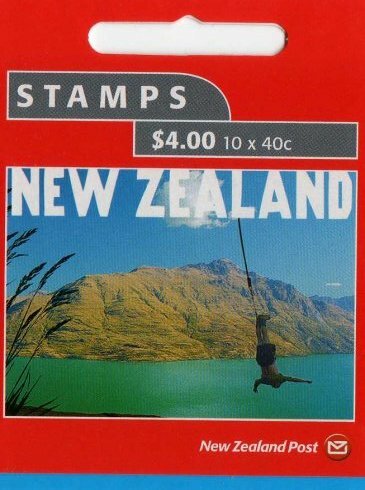 10 self adhesive stamps of 40c 100 Years Of Tourism. Red foldable cover incorporating a hanging slot. 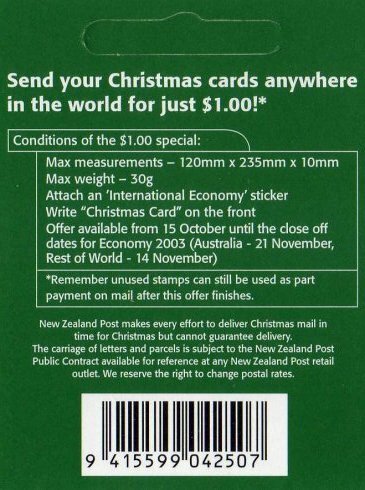 Contains 10 FastPost labels. 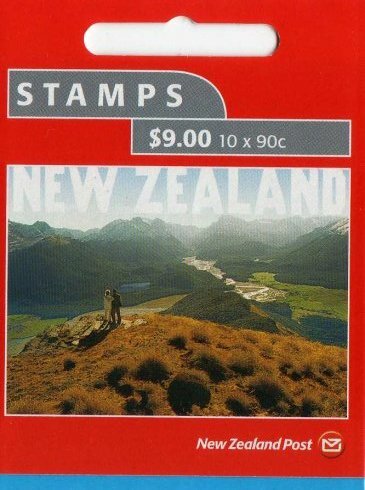 10 self adhesive stamps of 90c 100 Years Of Tourism. Red foldable cover incorporating a hanging slot. 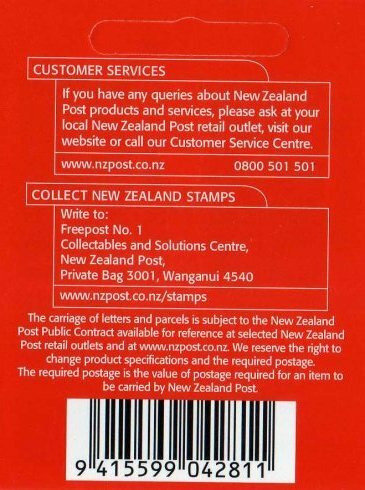 Contains 10 FastPost labels. 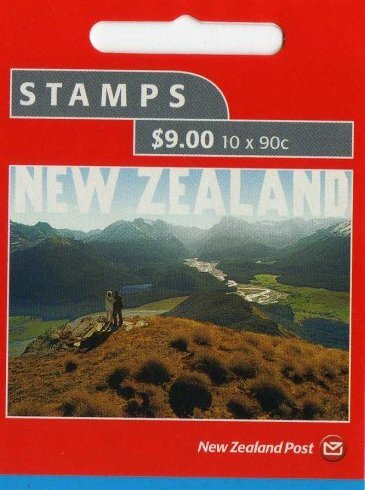 10 self adhesive stamps of 90c 100 Years Of Tourism. Red foldable cover incorporating a hanging slot. 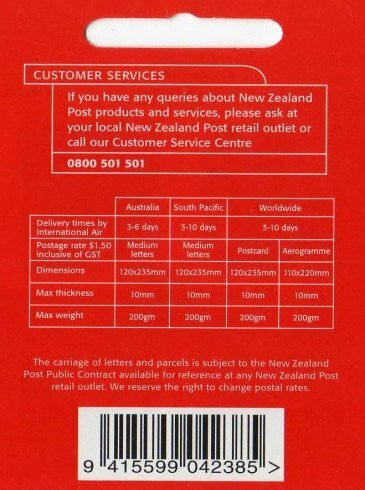 Contains 10 FastPost labels. As W83a, but with 1 Kiwi symbol. 5 self adhesive stamps of $1.50 Sea Kayaking. Red foldable cover incorporating a hanging slot. One stamp is on inside of front cover, the other four are on inside of back cover. 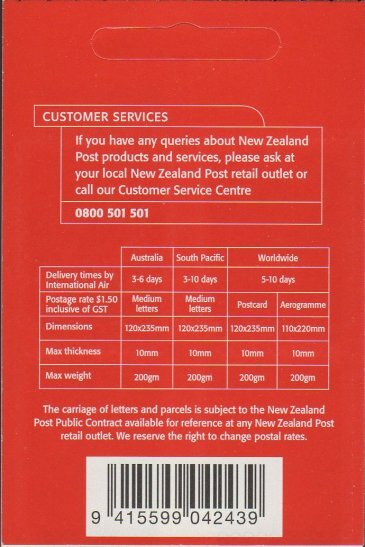 Inside are also 5 Air International labels. 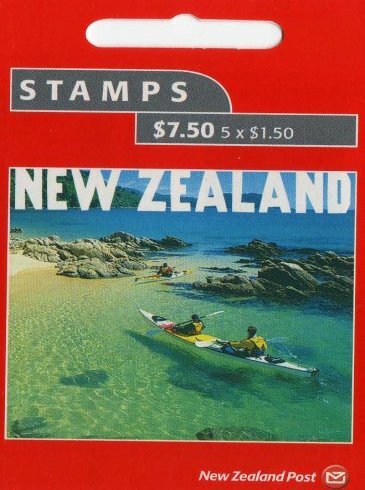 5 self adhesive stamps of $1.50 Sea Kayaking. Red foldable cover incorporating a hanging slot. 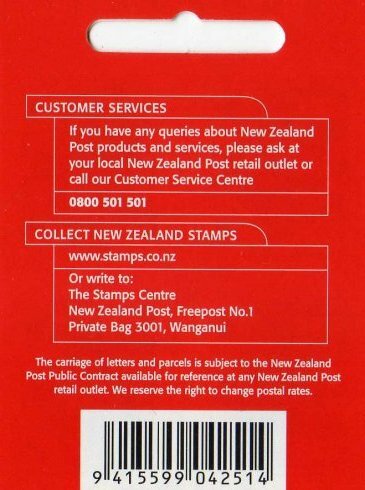 One stamp is on inside of front cover, the other four are on inside of back cover. 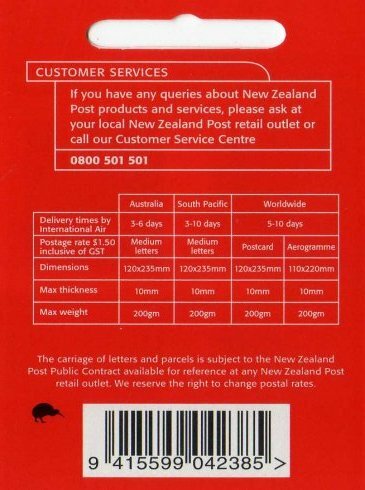 Inside are also 5 Air International labels. 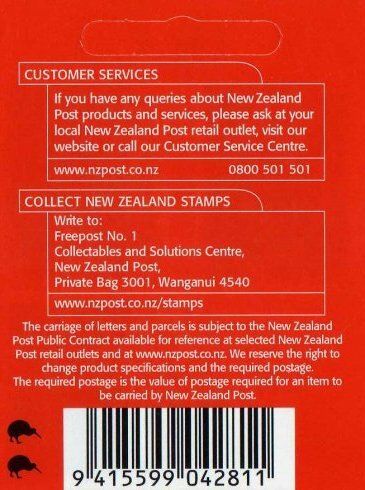 As W84a, but with 1 Kiwi symbol. 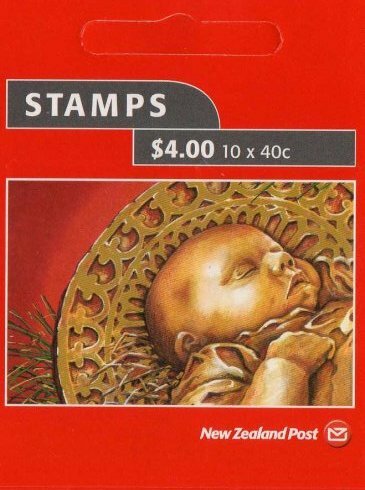 10 self adhesive stamps of 40c Christmas. Red foldable cover incorporating a hanging slot. 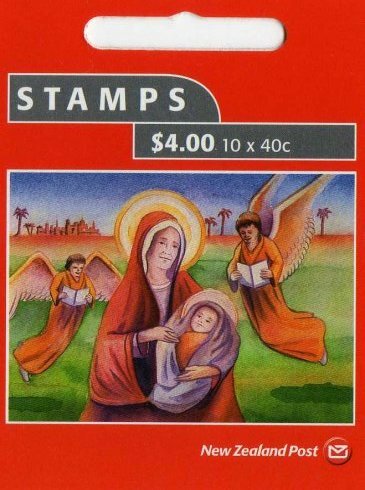 10 self adhesive stamps. 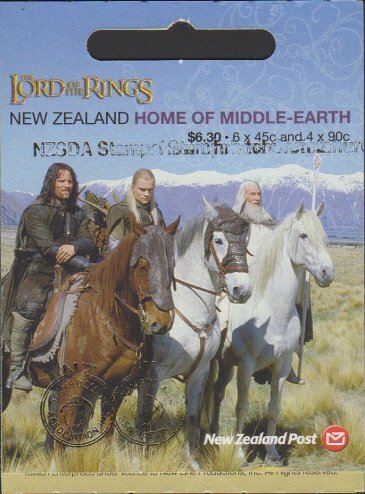 2 x 40c, 1 x 80c, 2 x 90c, 1 x $1.30, 1 x $1.50 and 1 x $2.00 of Lord Of The Rings I. Multicolour foldable cover incorporating a hanging slot. 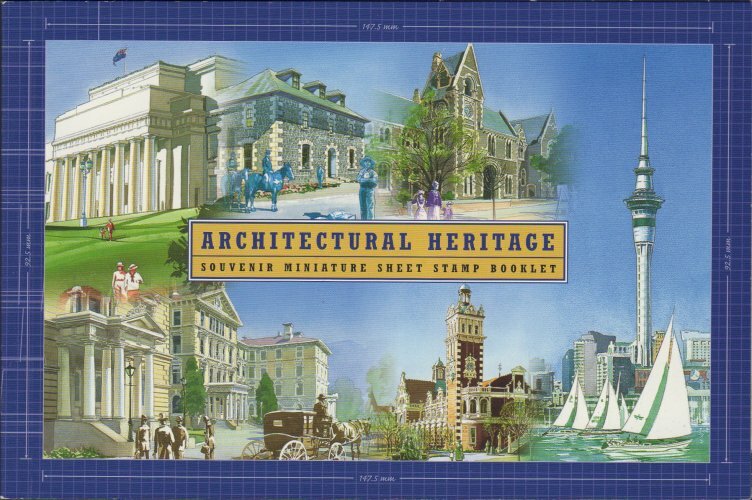 The booklet contains one of each value, in the set of 6 Architectural Heritage, in miniature sheet form and a seventh miniature sheet containing all 6 values. 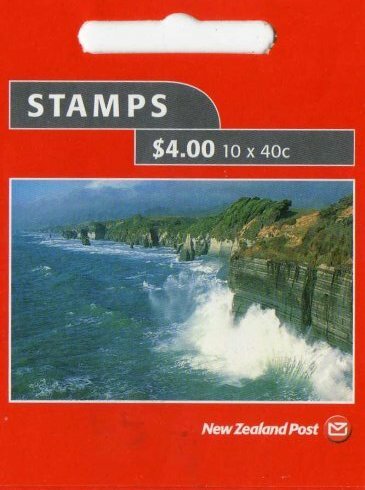 10 self adhesive stamps of 40c Tongaporutu Cliffs. Red foldable cover incorporating a hanging slot. 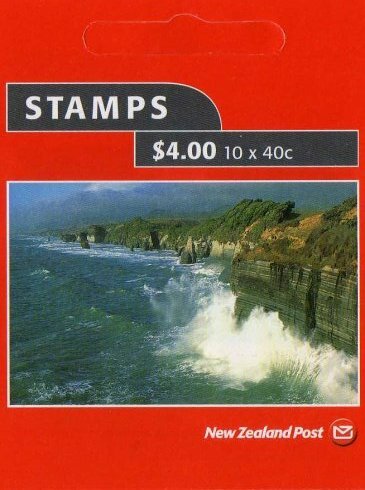 10 self adhesive stamps of 40c Tongaporutu Cliffs. Red foldable cover with flap incorporating a hanging slot. As W87a, but with 1 Kiwi symbol. 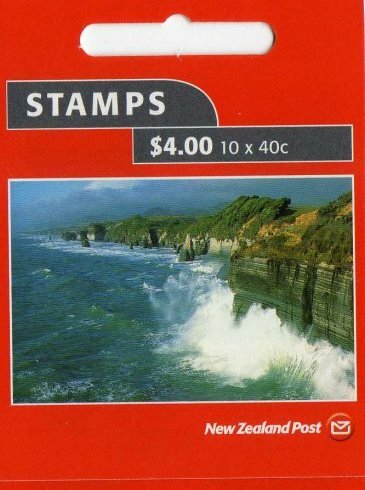 10 self adhesive stamps of 40c Tongaporutu Cliffs. Red foldable cover incorporating a hanging slot. 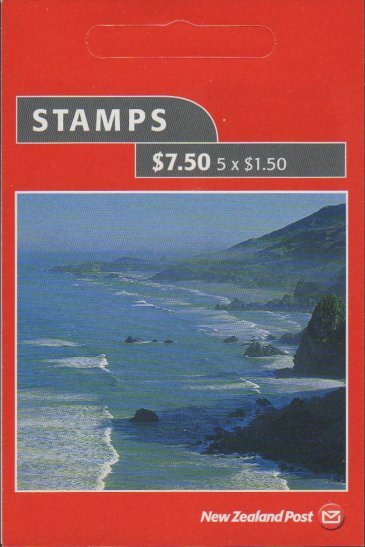 As W87a, but with all stamp print omitted. 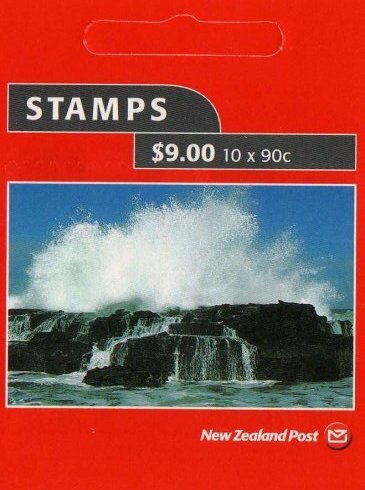 10 self adhesive stamps of 90c Curio Bay. Red foldable cover incorporating a hanging slot. 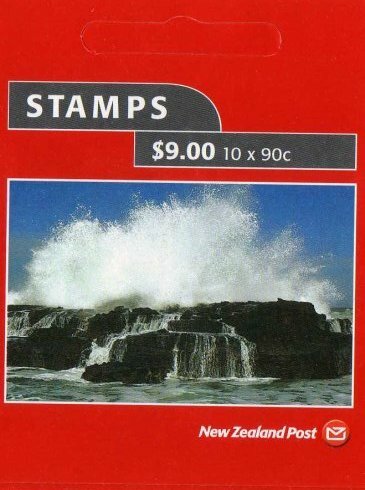 10 self adhesive stamps of 90c Curio Bay. Red foldable cover incorporating a hanging slot. 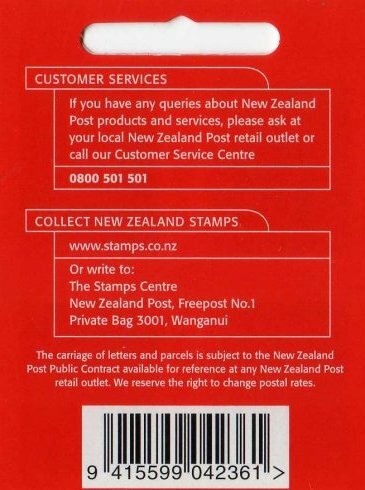 As W88a, but with 1 Kiwi symbol. 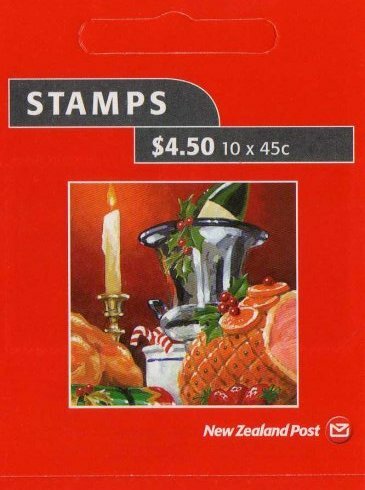 5 self adhesive stamps of $1.50 Meybille Bay. Red foldable cover incorporating a hanging slot. 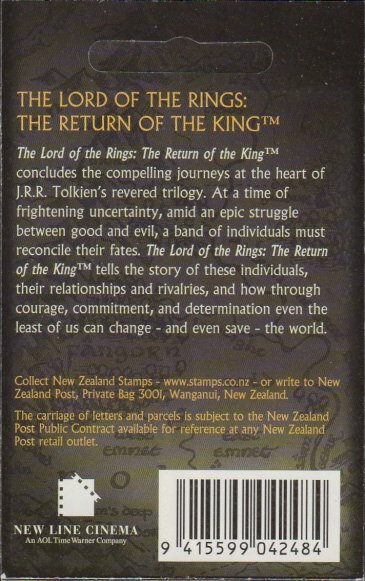 One stamp is on inside of front cover, the other four are on inside of back cover. 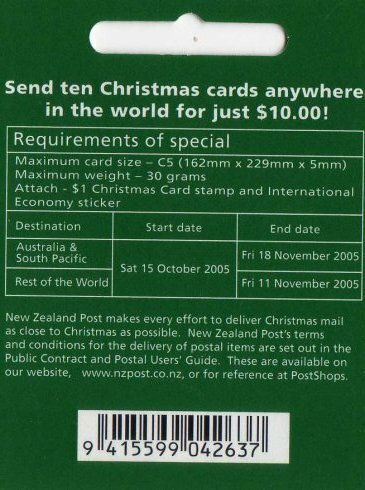 10 self adhesive stamps. 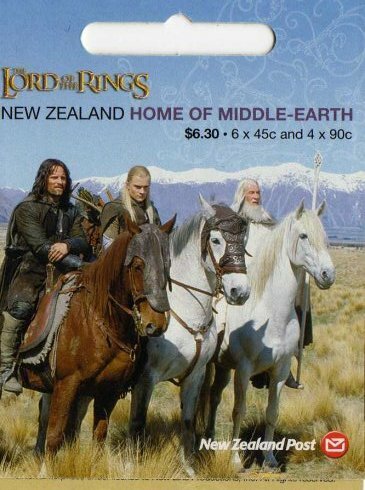 2 x 40c, 1 x 80c, 2 x 90c, 1 x $1.30, 1 x $1.50 and 1 x $2.00 of Lord Of The Rings II. Multicolour foldable cover incorporating a hanging slot. 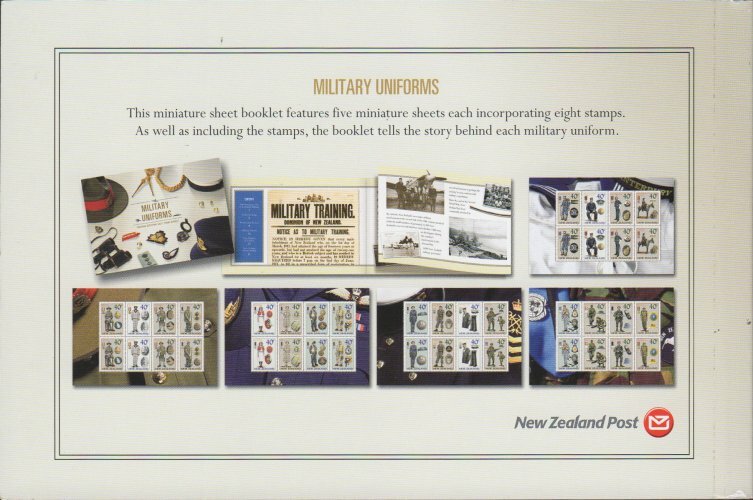 The booklet contains 5 miniature sheets, each with 8 stamps. 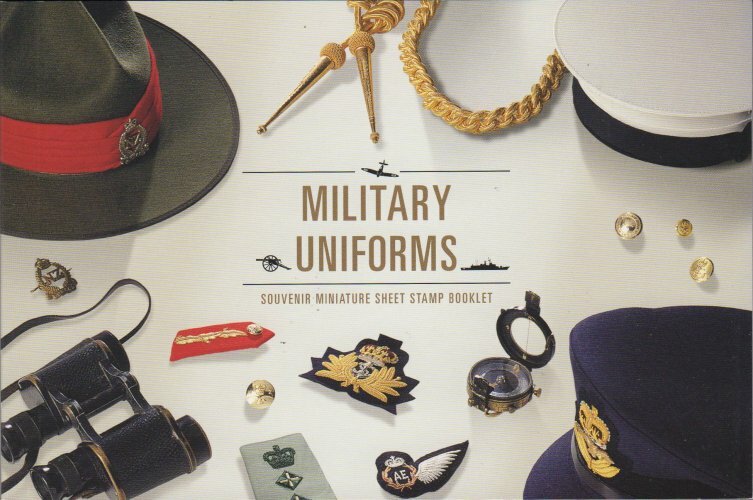 (4 different stamps from the set of 20 of Military Uniforms, with these 4 stamps duplicated in a second row). 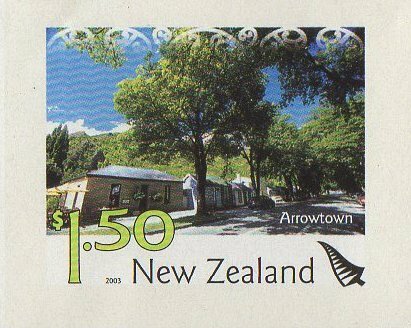 5 self adhesive stamps of $1.50 Arrowtown. Red foldable cover incorporating a hanging slot. 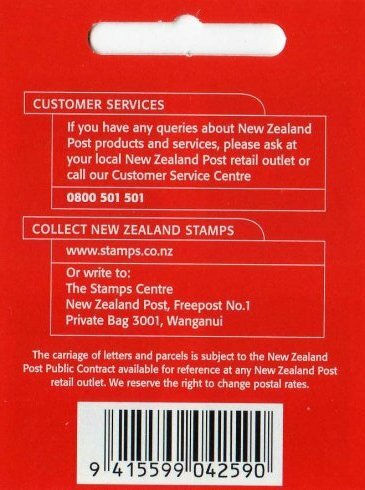 One stamp is on inside of front cover, the other four are on inside of back cover. 5 self adhesive stamps of $1.50 Arrowtown. Red foldable cover flap incorporating a hanging slot. 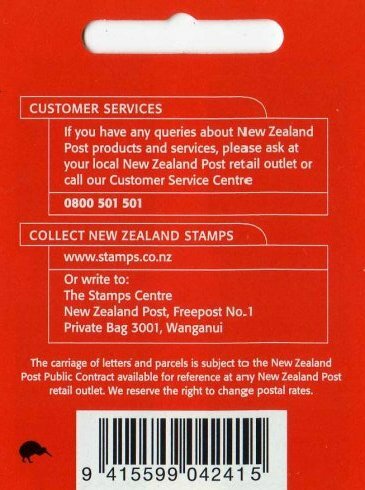 One stamp is on inside of front cover, the other four are on inside of back cover. 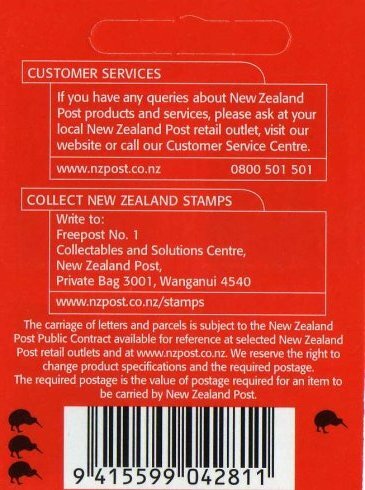 There are ten stickers on the back flap. 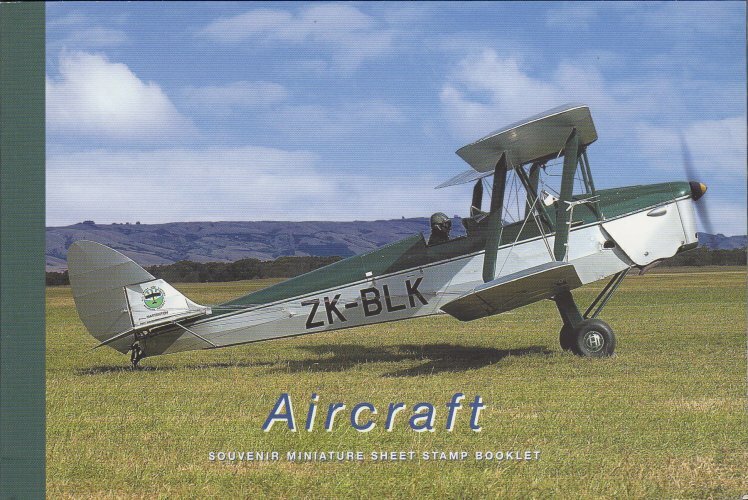 Now with three folds and actual stamp picture on cover. 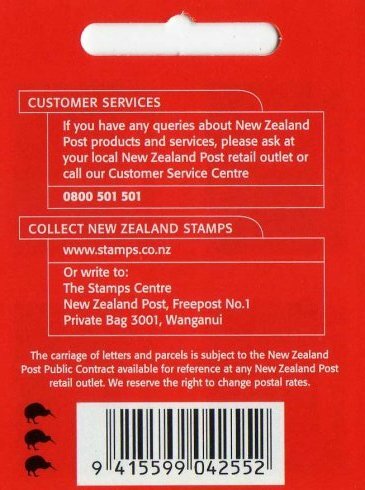 1 Kiwi symbol. 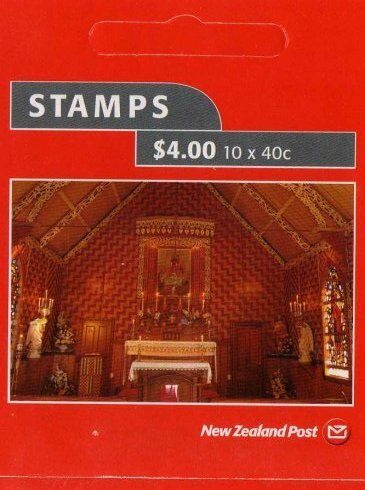 5 self adhesive stamps of $1.50 Arrowtown. Red foldable cover incorporating a hanging slot. 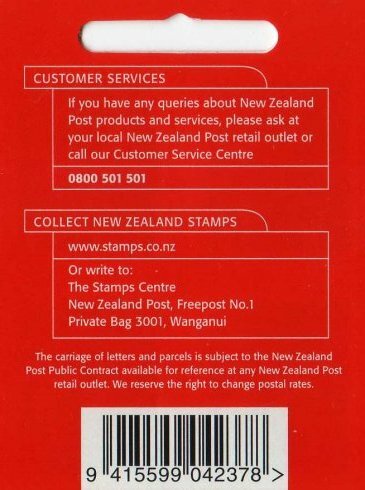 One stamp is on inside of front cover, the other four are on inside of back cover. 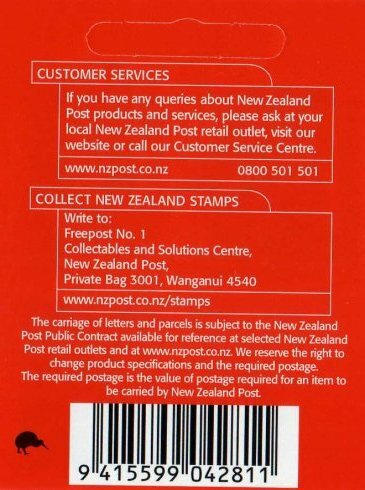 There are ten stickers on the back flap. 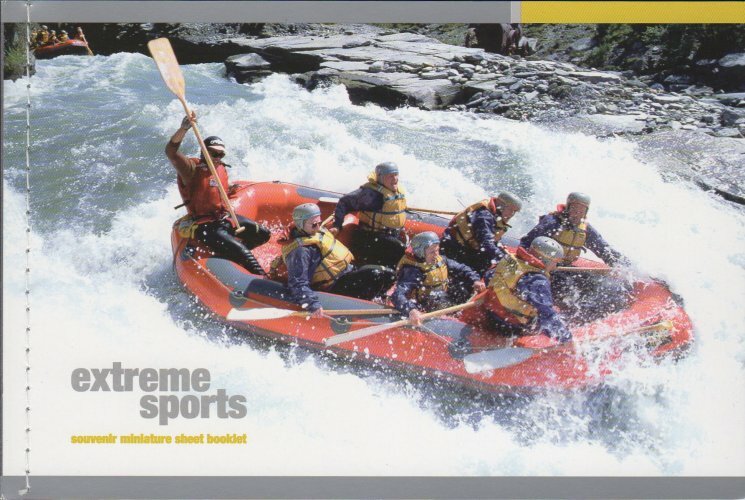 Now with three folds and actual stamp picture on cover. 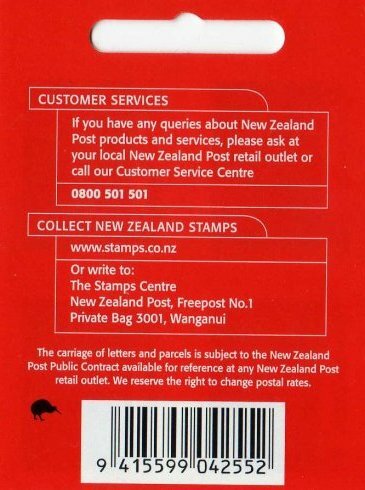 2 Kiwi symbol. 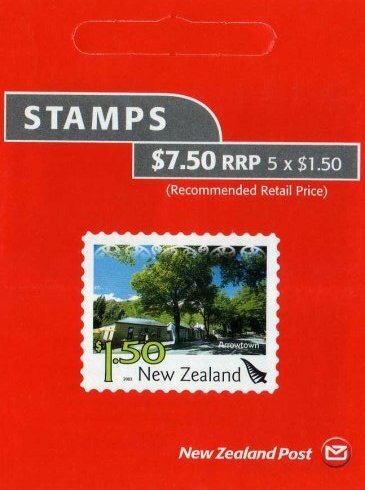 5 self adhesive stamps of $1.50 Arrowtown. Red foldable cover incorporating a hanging slot. 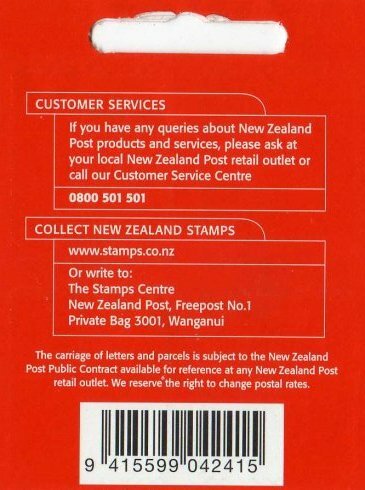 One stamp is on inside of front cover, the other four are on inside of back cover. 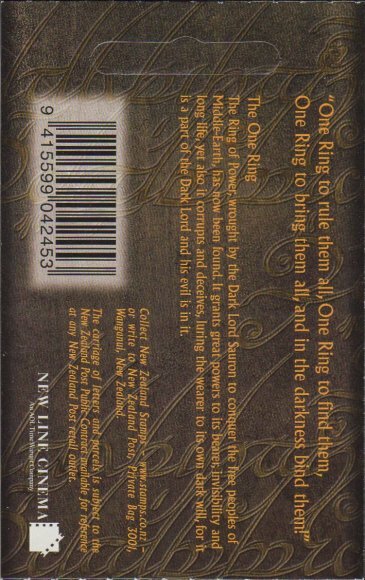 There are ten stickers on the back flap. 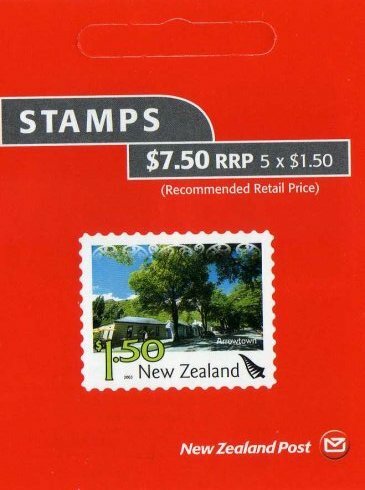 Now with three folds and actual stamp picture on cover, with the addition of "Recommended Retail Price". 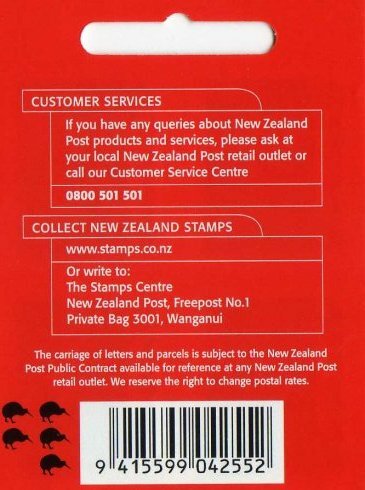 3 Kiwi symbol. 5 self adhesive stamps of $1.50 Arrowtown. Red foldable cover incorporating a hanging slot. 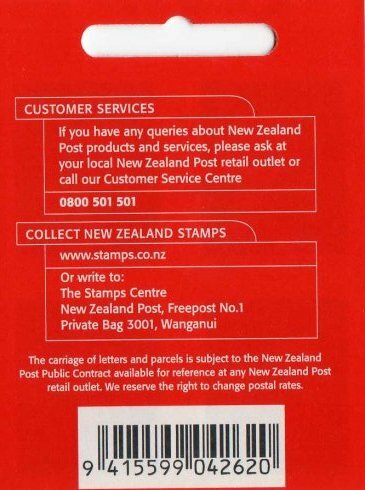 One stamp is on inside of front cover, the other four are on inside of back cover. 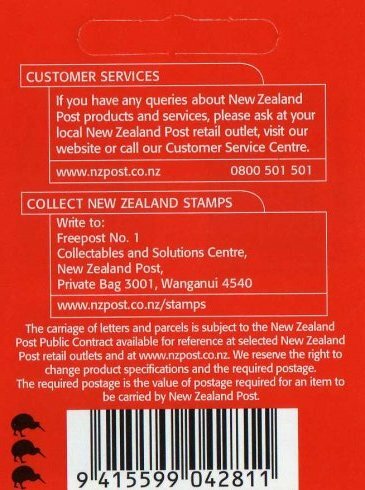 There are ten stickers on the back flap. 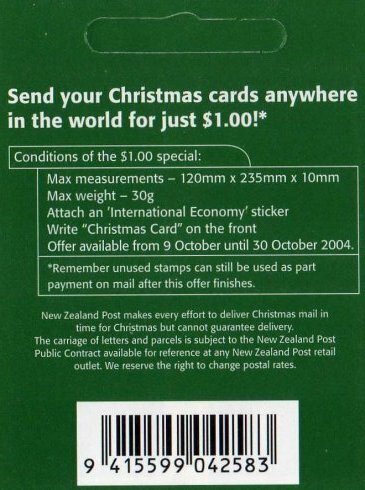 Now with three folds and actual stamp picture on cover, with the addition of "Recommended Retail Price". 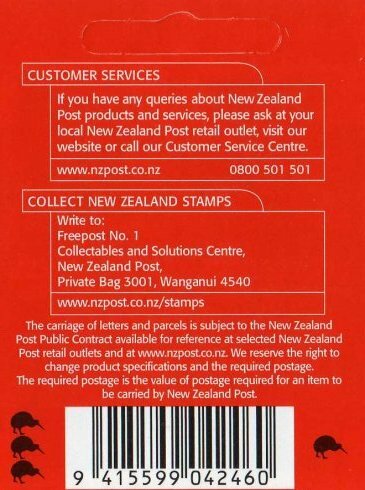 4 Kiwi symbol. 5 self adhesive stamps of $1.50 Arrowtown. Red foldable cover incorporating a hanging slot. 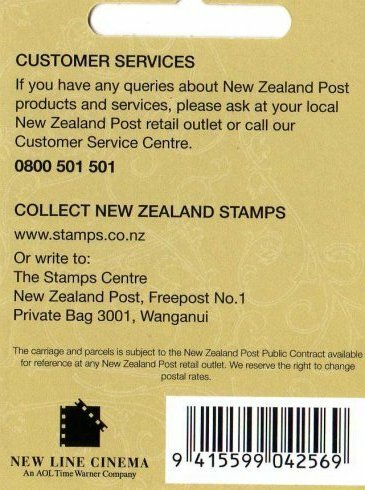 Two stamps are on inside of front cover, the other three are on inside of back cover. 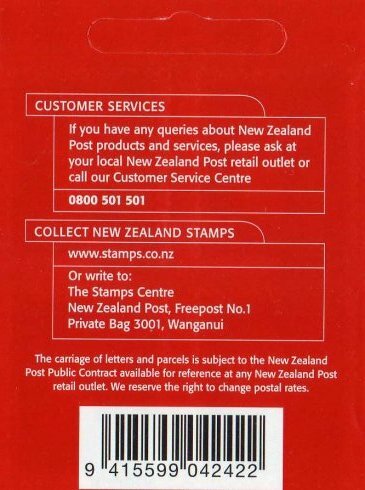 Ten stickers replaced with two airmail on the back flap. Barcode now ending in 804 instead of 460. 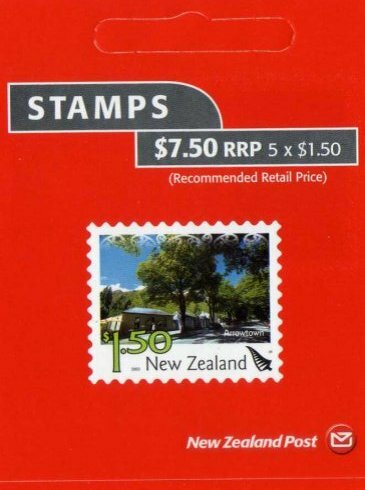 5 self adhesive stamps of $1.50 Arrowtown. Red foldable cover incorporating a hanging slot. 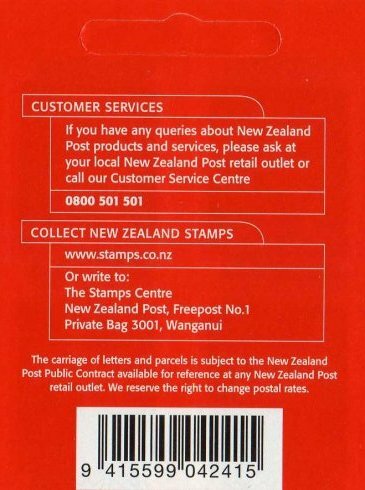 Two stamps are on inside of front cover, the other three are on inside of back cover. 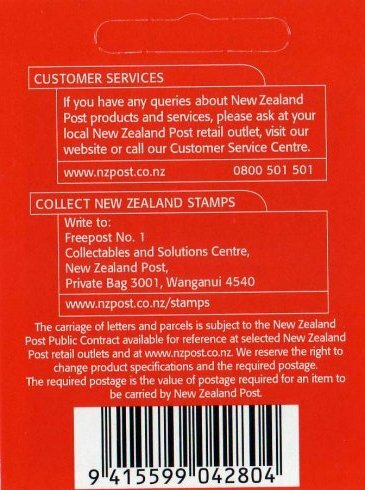 Now no back flap, just two folds, no stickers. Barcode now ending in 811 instead of 804. 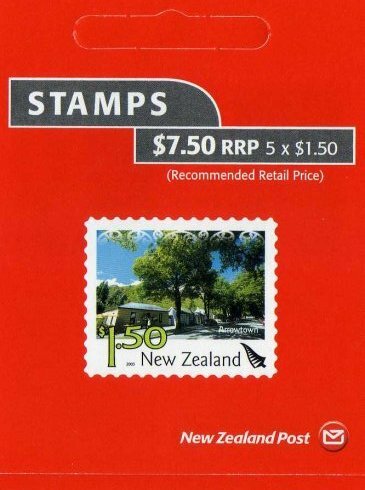 5 self adhesive stamps of $1.50 Arrowtown. Red foldable cover incorporating a hanging slot. 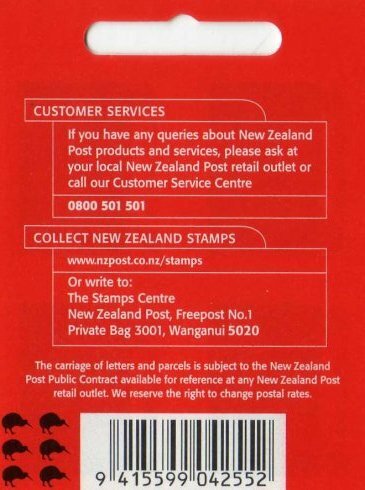 Two stamps are on inside of front cover, the other three are on inside of back cover. 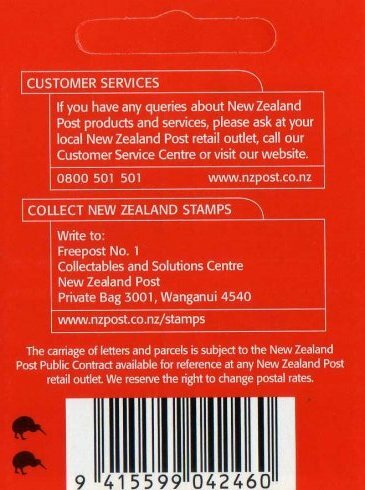 Now no back flap, just two folds, no stickers. Barcode now ending in 811 instead of 804. 1 Kiwi symbol. 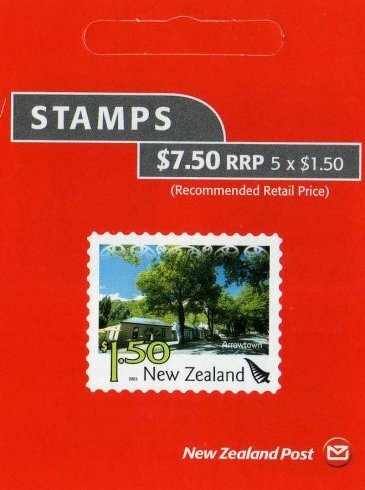 5 self adhesive stamps of $1.50 Arrowtown. Red foldable cover incorporating a hanging slot. 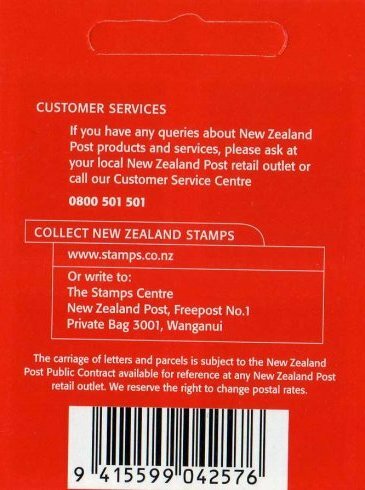 Two stamps are on inside of front cover, the other three are on inside of back cover. 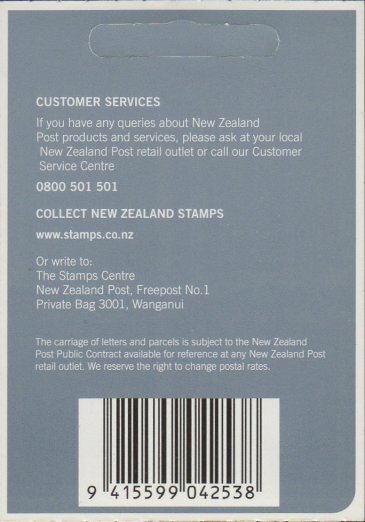 Now no back flap, just two folds, no stickers. Barcode now ending in 811 instead of 804. 2 Kiwi symbol. 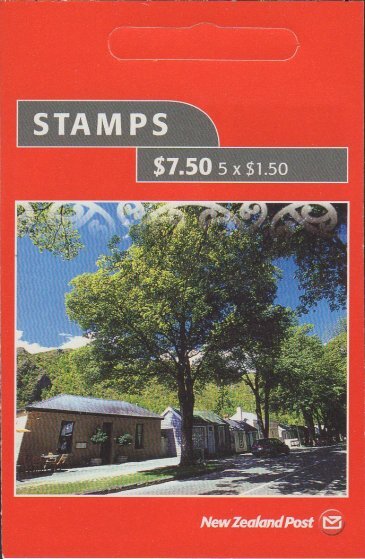 5 self adhesive stamps of $1.50 Arrowtown. Red foldable cover flap incorporating a hanging slot. 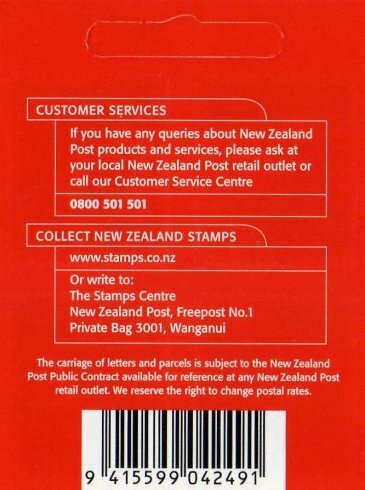 Two stamps are on inside of front cover, the other three are on inside of back cover. 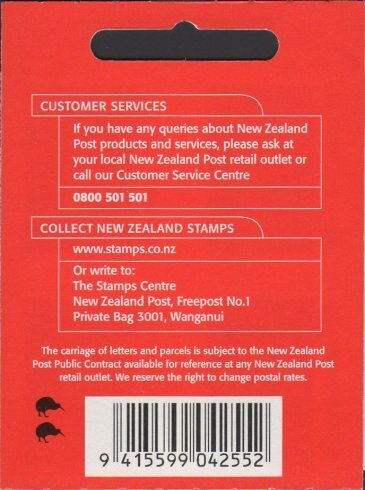 Now no back flap, just two folds, no stickers. Barcode now ending in 811 instead of 804. 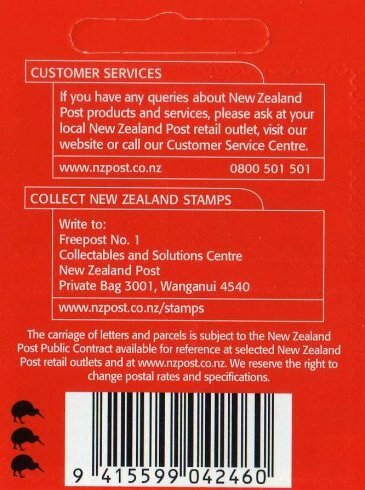 3 Kiwi symbol. 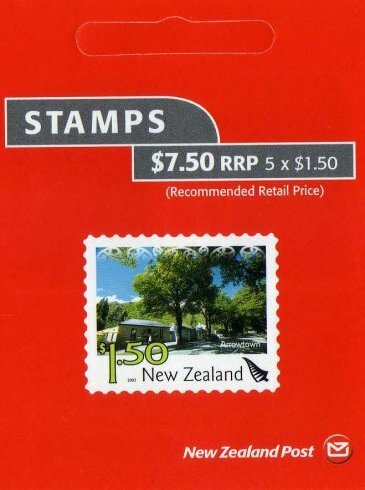 5 self adhesive stamps of $1.50 Arrowtown. Red foldable cover incorporating a hanging slot. Two stamps are on inside of front cover, the other three are on inside of back cover. 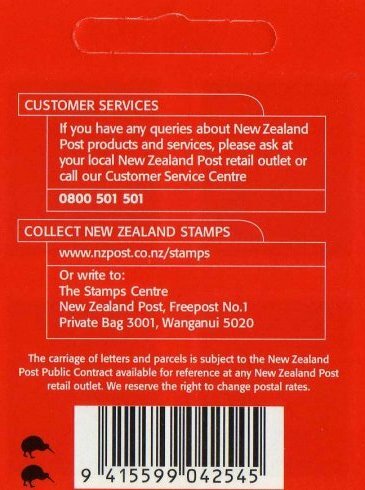 Now no back flap, just two folds, no stickers. Barcode now ending in 811 instead of 804. 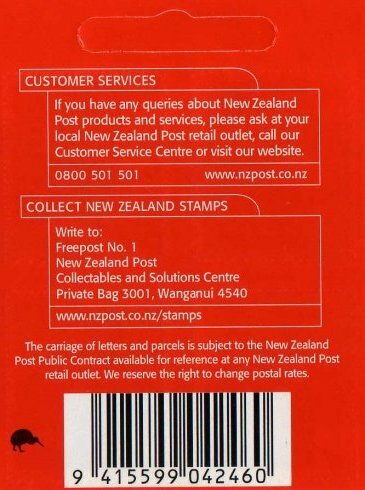 4 Kiwi symbol. 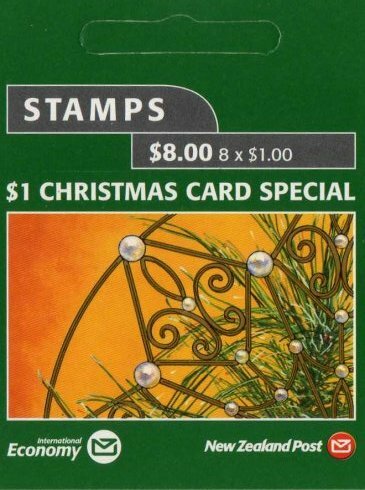 8 self adhesive stamps of $1.00 Christmas. Green foldable cover incorporating a hanging slot. 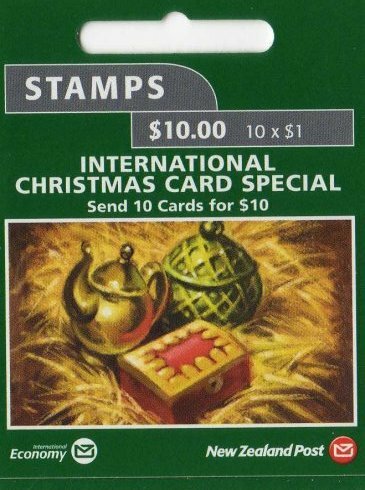 10 self adhesive stamps. 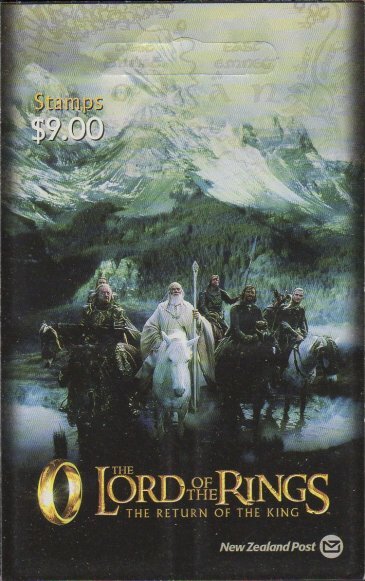 2 x 40c, 1 x 80c, 2 x 90c, 1 x $1.30, 1 x $1.50 and 1 x $2.00 of Lord Of The Rings III. Multicolour foldable cover incorporating a hanging slot. 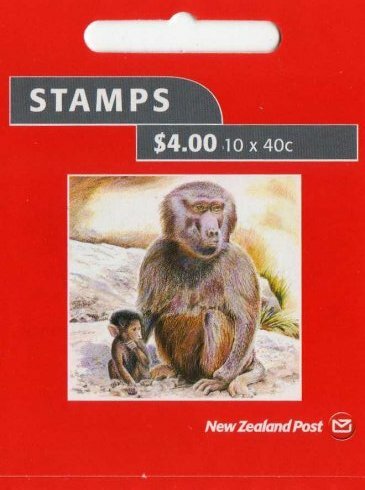 10 self adhesive stamps of 40c Baboon. Red foldable cover incorporating a hanging slot. 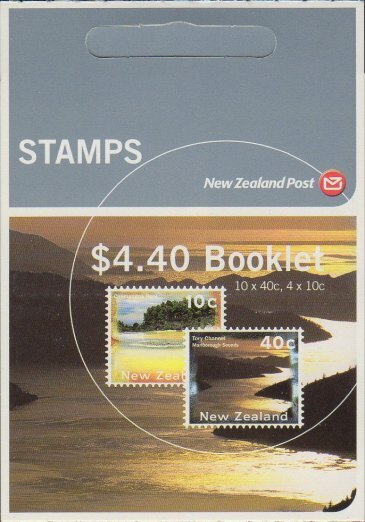 14 self adhesive stamps (4 x 10c Champagne Pool, 10 x 40c Tory Channel, Marlborough Sounds). Blue/Grey foldable cover incorporating a hanging slot. 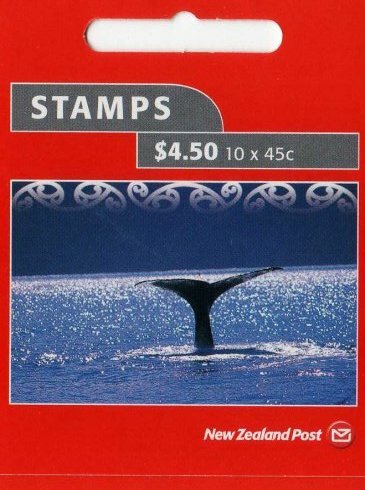 10 self adhesive stamps of 45c Kaikoura. Red foldable cover incorporating a hanging slot. 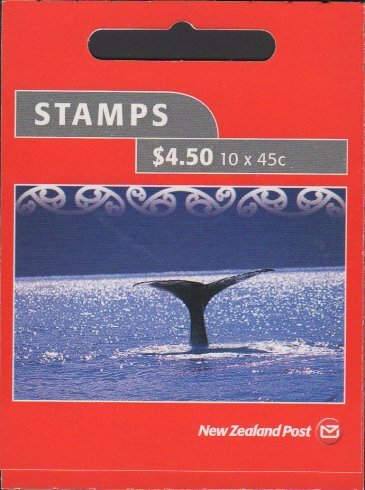 10 self adhesive stamps of 45c Kaikoura. Red foldable cover incorporating a hanging slot. 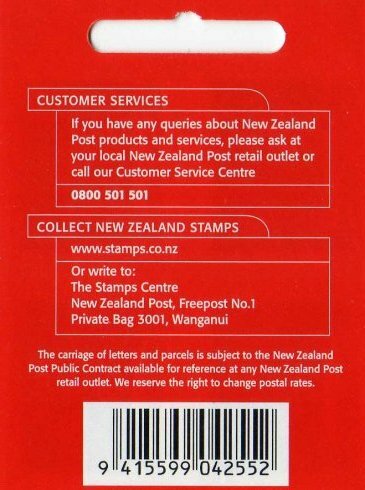 As W98a, but with 1 Kiwi symbol. 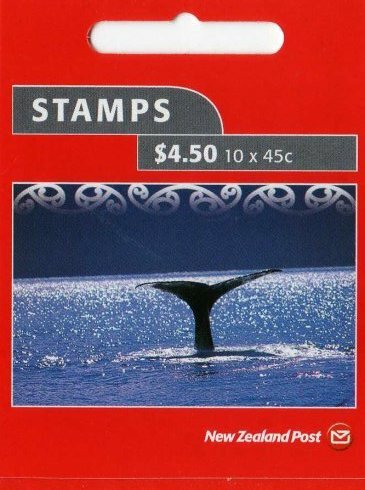 10 self adhesive stamps of 45c Kaikoura. Red foldable cover incorporating a hanging slot. As W98a, but with 2 Kiwi symbol. 10 self adhesive stamps of 45c Kaikoura. Red foldable cover incorporating a hanging slot. 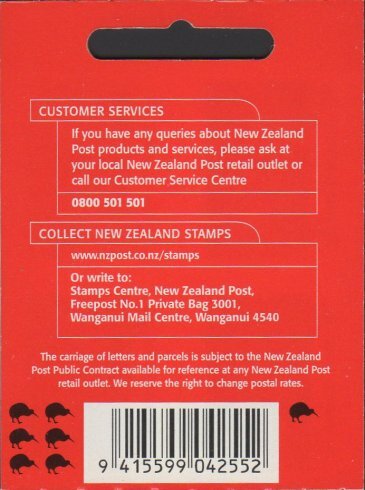 As W98a, but with 3 Kiwi symbol. 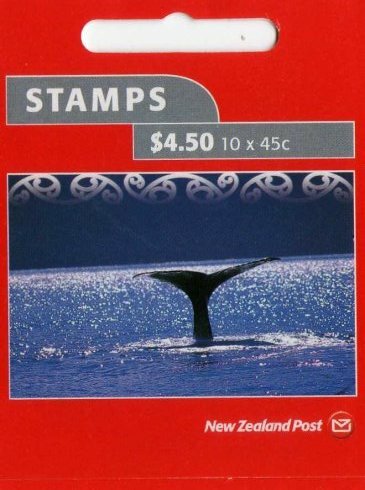 10 self adhesive stamps of 45c Kaikoura. Red foldable cover incorporating a hanging slot. 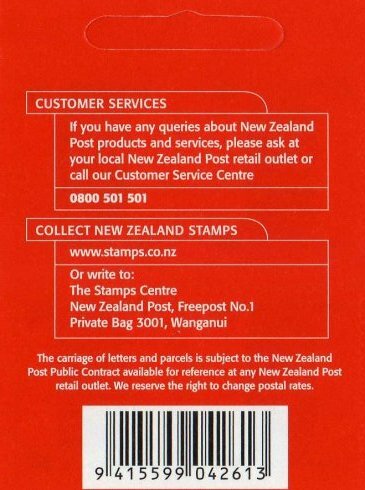 As W98a, but with 4 Kiwi symbol. 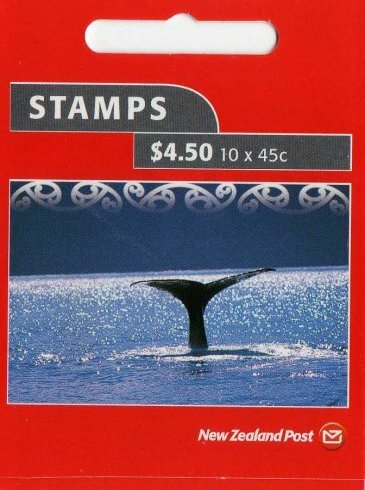 10 self adhesive stamps of 45c Kaikoura. Red foldable cover incorporating a hanging slot. 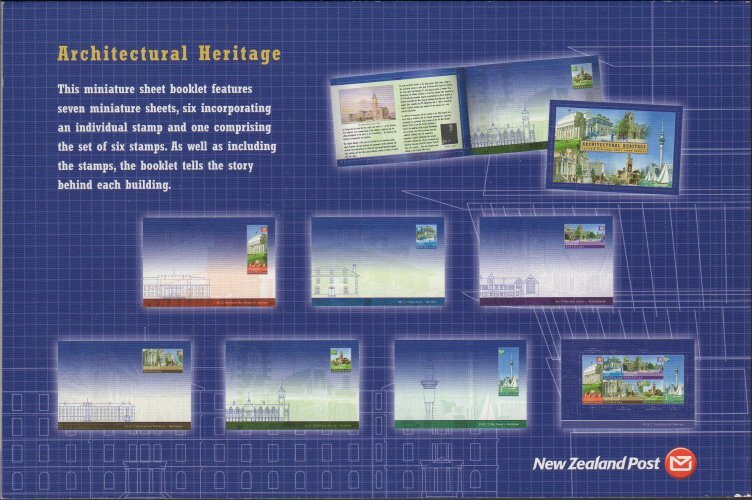 As W98a, but with 5 Kiwi symbol. 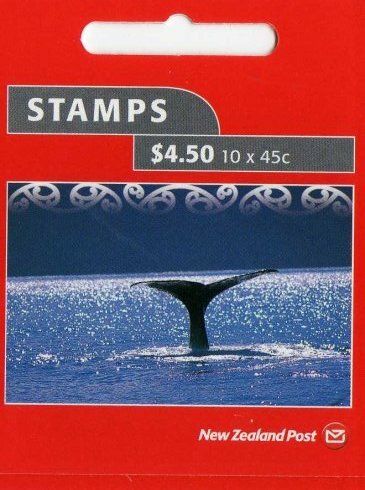 10 self adhesive stamps of 45c Kaikoura. Red foldable cover incorporating a hanging slot. 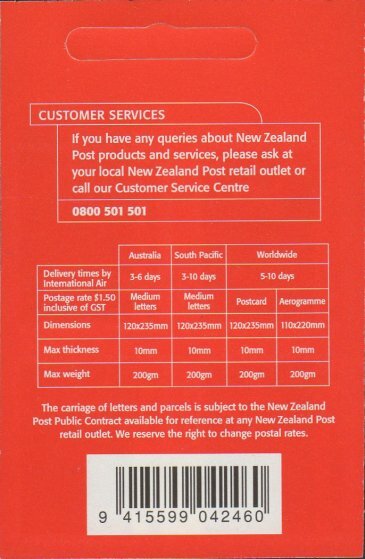 As W98a, but with 6 Kiwi symbol. 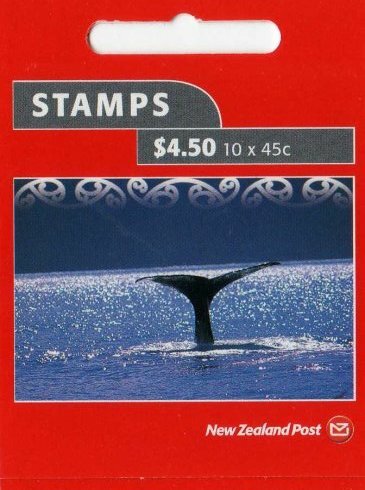 10 self adhesive stamps of 45c Kaikoura. Red foldable cover incorporating a hanging slot. 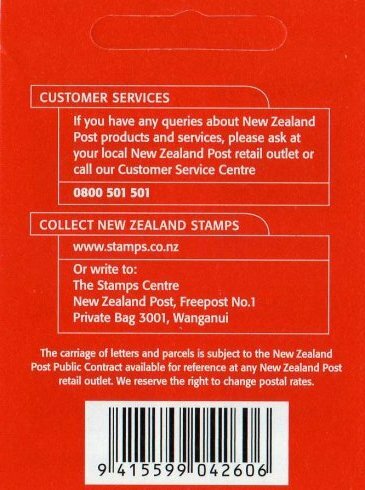 As W98a, but with 7 Kiwi symbol. 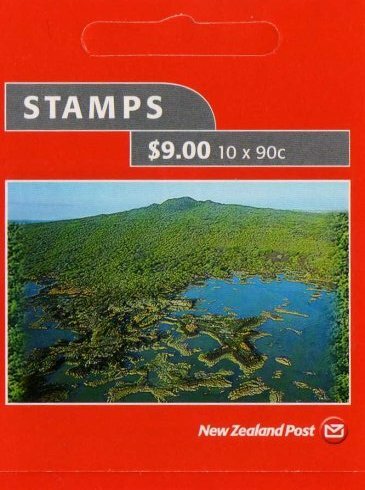 10 self adhesive stamps of 90c Rangitoto Island. Red foldable cover incorporating a hanging slot. 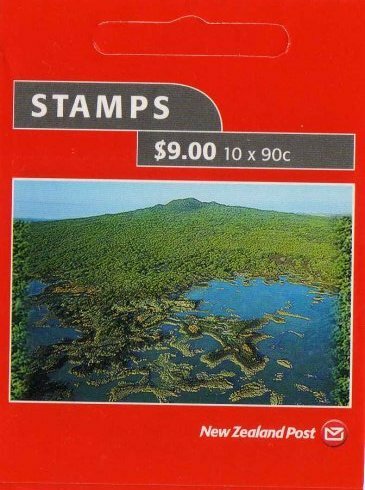 10 self adhesive stamps of 90c Rangitoto Island. Red foldable cover incorporating a hanging slot. 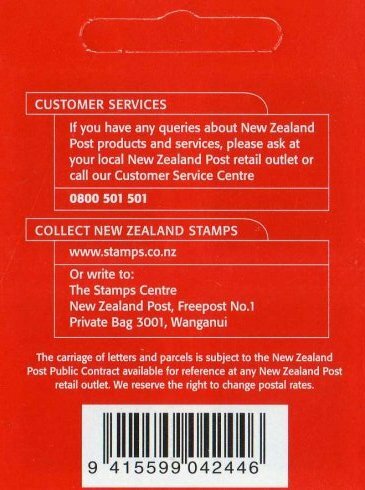 As W99a, but with 1 Kiwi symbol. 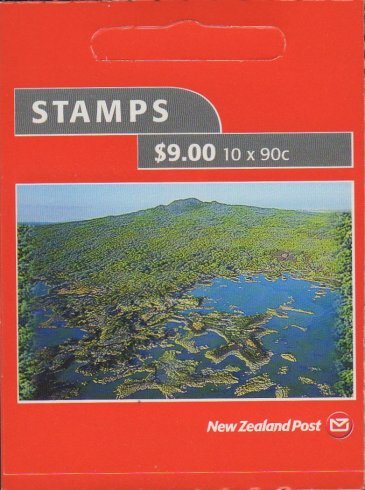 10 self adhesive stamps of 90c Rangitoto Island. Red foldable cover incorporating a hanging slot. 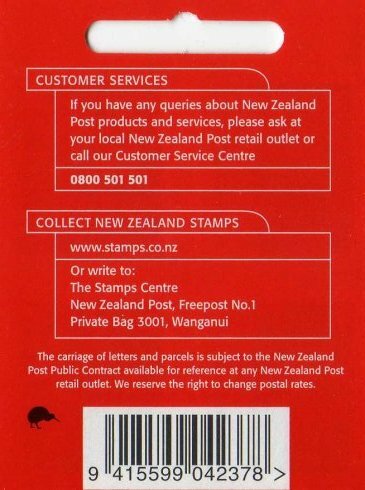 As W99a, but with 2 Kiwi symbol. 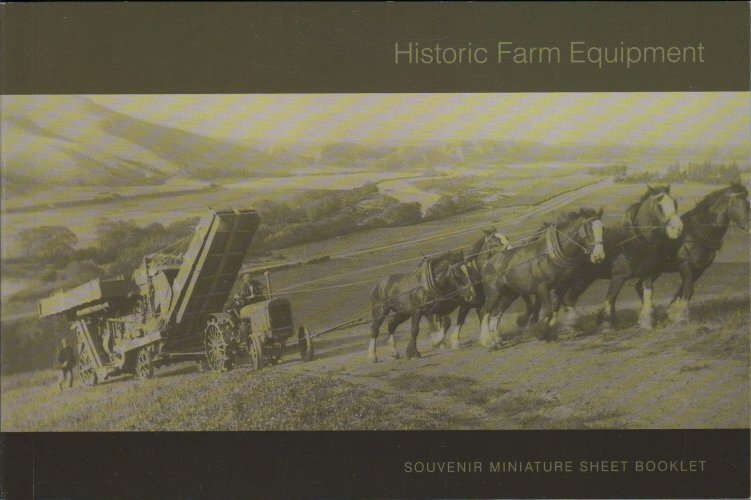 The booklet contains one of each value, in the set of 5 Historic Farm Equipment, in miniature sheet form and a sixth miniature sheet containing all 5 values. 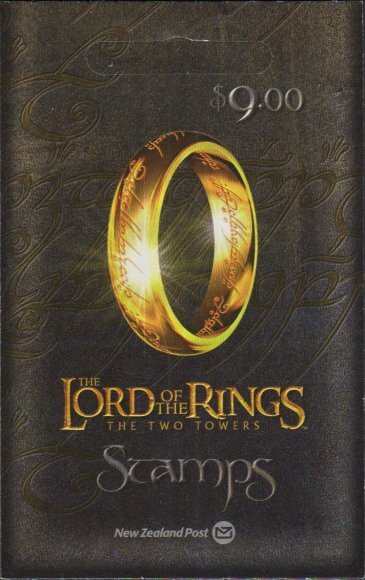 10 self adhesive stamps, (3 of each of the 2 x 45c and 2 of each of the 2 x 90c) of Lord Of The Rings - Home Of Middle Earth. Multicolour foldable cover incorporating a hanging slot. 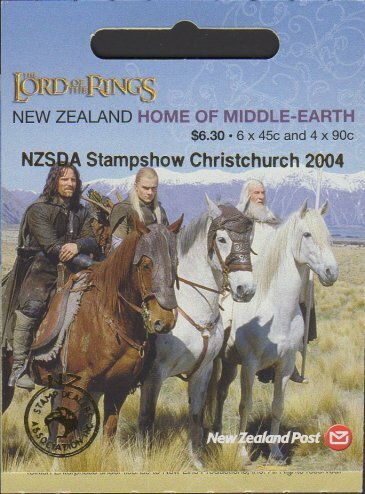 10 self adhesive stamps, (3 of each of the 2 x 45c and 2 of each of the 2 x 90c) of Lord Of The Rings - Home Of Middle Earth. Multicolour foldable cover with flap incorporating a hanging slot. 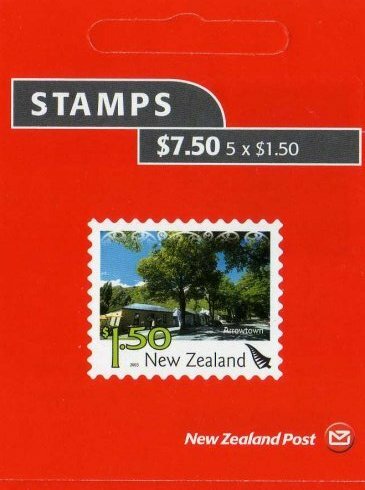 This is an unofficial overprint from the New Zealand Stamp Dealers Association, commemorating the 2004 NZSDA Stampshow in Christchurch. 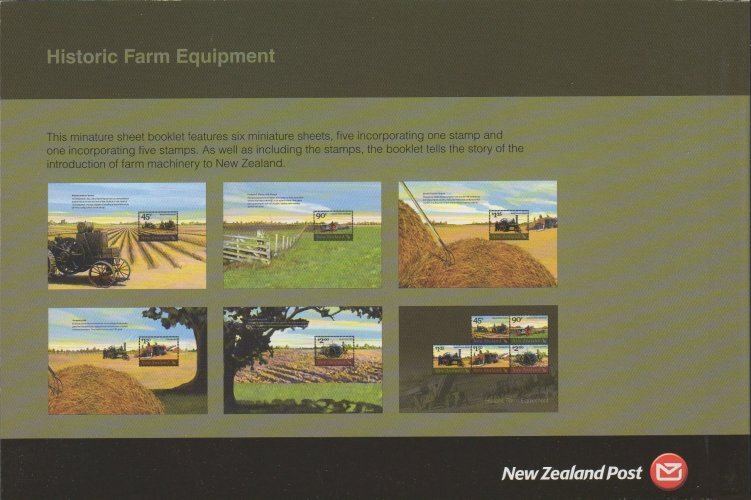 The second image shows an example where the overprint has been applied twice, 10mm apart. 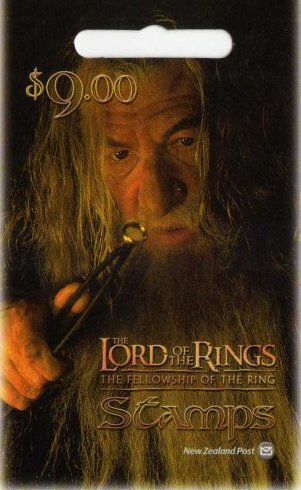 The only known copy. 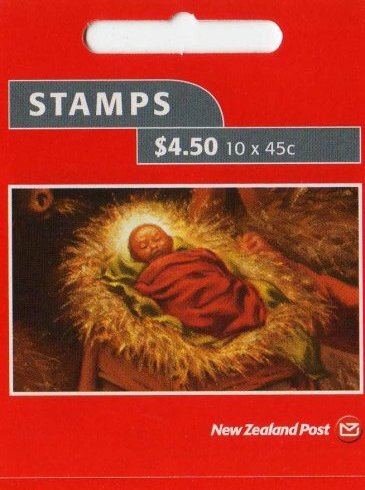 10 self adhesive stamps of 45c Christmas. Red foldable cover incorporating a hanging slot. 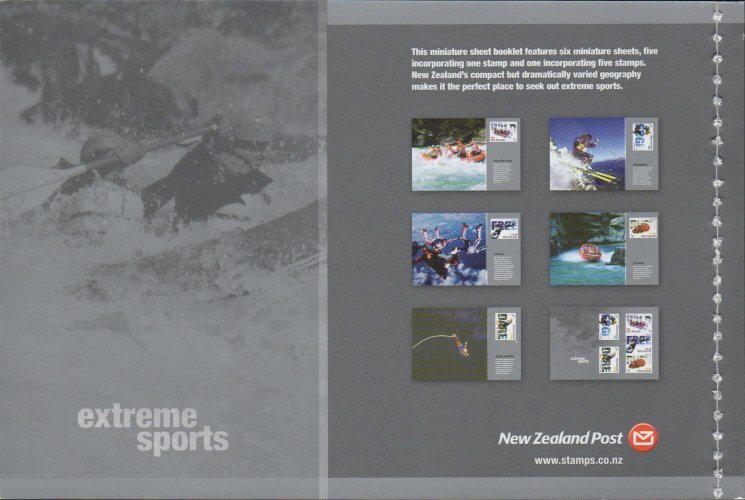 The booklet contains one of each value, in the set of 5 Extreme Sports, in miniature sheet form and a sixth miniature sheet containing all 5 values. 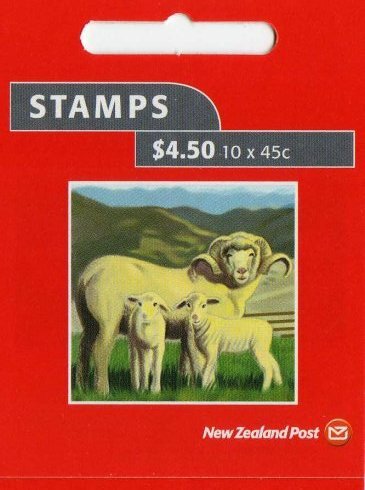 10 self adhesive stamps of 45c Farmyard. Red foldable cover incorporating a hanging slot. 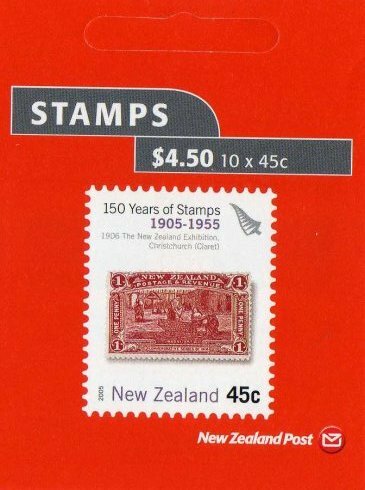 10 self adhesive stamps of 45c 1d 1906 Christchurch Exhibition Stamp. Red foldable cover incorporating a hanging slot. 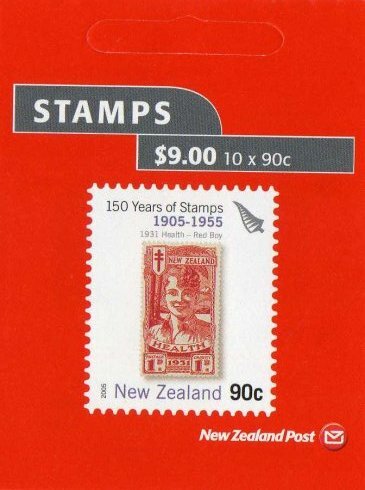 10 self adhesive stamps of 90c 1d Red 1931 Health Stamp. Red foldable cover incorporating a hanging slot. 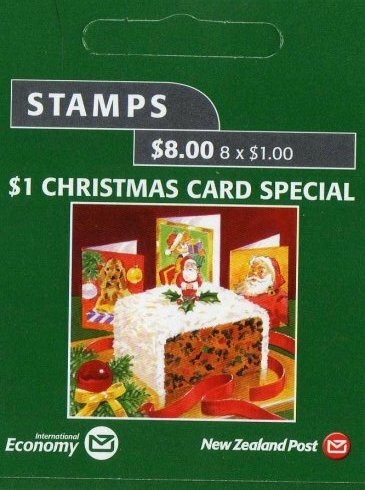 10 self adhesive stamps of $1.00 Christmas. Green foldable cover incorporating a hanging slot.